As code requirements and consumer demand raise the performance of U.S. homes, energy efficiency isn't the marketing differentiator it once was. Just ask Brandon DeYoung of DeYoung Properties. When he, along with his brother and sister, took over the family's Fresno, Calif. homebuilding business a decade ago they had a vision: build super energy-efficient homes with low electric bills and minimal environmental impact. They've succeeded. Their latest project is a community of 36 Zero-Energy production homes, the state's largest. But while that community is newsworthy, it doesn't put the company as far ahead of the pack as they would like to be. A new rule from the California Energy Commission will require all homes built after 2020 to have rooftop solar panels, so the DeYoungs did what all marketers always do: find additional ways to set themselves apart. The result was the DeYoung Smart Home. Every home is outfitted with a Samsung home automation hub, as well as a smart light switch and door lock. "Buyers can add lots of other smart devices as options," he says. This has helped the company keep its edge. "If energy is the only focus you will miss some of the market. The buyer looking for an efficient home will also be looking for higher-quality products in general." DeYoung isn't alone in this thinking. High-performance builders, along with trade groups like the Energy & Environmental Building Alliance, have been trying to raise the efficiency bar of new homes for years. With that effort paying off, leaders in the high-performance niche are embracing further innovations. From a sales and marketing standpoint, the best innovations push buyers' hot buttons. The desire for smart technology is certainly one of these, but a potentially stronger one is health. Energy efficient homes are engineered for good indoor air quality, and a growing number of builders are giving that top billing. One of these is Phoenix-area Fulton Homes. Although it's an ENERGY STAR builder, VP of Operations Dennis Webb says that designation has lost some of its edge. "In Phoenix, ENERGY STAR has become an ante to get in the game." Four years ago, Fulton signed on the US EPA's Indoor airPLUS program. They now use low-VOC adhesives, carpet and carpet pad as well as an electronic air cleaner and a radon detector. Workers also seal duct openings during construction to keep them from getting filled with drywall dust and other contaminants that can get blown into the house later. Webb says that cost is minimal: since they were already doing ENERGY STAR, it only adds a few hundred dollars per home, which the company absorbs. It has been a great differentiator. "It's an awesome marketing tool that gives us a decisive advantage," says Webb. For one thing, most consumers haven't heard about the program so they perceive it as cutting edge. More importantly, it addresses parents' concerns. "About 12% of kids in Arizona have asthma, and if your kid is one of these, health becomes way more important than granite countertops. We simply ask people if they would rather live in a home with healthy air or stale air." Competition has also led Denver-based Thrive Home Builders to pivot to a health focus. "The biggest development we build in is Stapleton," according to Susan Elovitz, the company's Director of Marketing. "The developer there backed us all the way when we wanted to do an entire community of Zero Energy homes. It was a big differentiator, but the developer liked it so much that they want other builders in the development to start building zero energy ready homes." Thrive, like Fulton, is doing Indoor airPLUS. Energy efficiency is still important, but it's now part of an overall healthy home message. "A lot of our clients care more about health," she says. "We see that as the next frontier." But while consumers want smart, healthy homes with predictable energy bills, those homes don't sell themselves. "Most of the builders doing Indoor airPLUS build great homes but aren't good at marketing," says Webb. "We spend more on marketing and advertising than any of them." Throwing money at the problem won't solve it, however. As for any marketing effort, builders in this niche must put a lot of thought into the three M's: the market, the message, and the medium. There are different ways to define the customer (the market). Some builders rely on a general understanding of what people in its area want. "Energy and comfort are important to our customers but we also have high asthma rates, and our summer air quality is as bad as Los Angeles, including lots of smoke from wildfires," says DeYoung, whose smart home features include technology to improve indoor air quality. Others prefer to create a specific customer avatar. "We identify our customer as a 35-year old woman who is all about the environment and the health of her family," says Elovitz. "She shops at Whole Foods, drives a Prius and in general pursues a healthy life." When deciding what to say (the message), Thrive aims squarely for this avatar but also tries not to alienate other customers. A good example of this is an ad showing a young mom feeding her baby. The tagline: "What she's breathing is as important as what you're feeding her." Fulton takes a broader approach by making sure the Indoor airPLUS label shows up everywhere: brochures, floor plans, price sheets and the front door of the design center. It has also trained its salespeople to talk with customers about the program. However, Webb cautions against making guarantees about energy use or health. "We make it clear that we're certified by EPA because we follow the steps required by the program and our work is verified by a third-party inspection company." DeYoung is even more careful in its messaging. They offer "a home designed with the potential to produce as much clean energy as it uses in a year." He says that the company relied heavily on its legal and PR advisors to come up with wording that gets the message across but deftly avoids making guarantees. For instance, they used "potential" production in recognition of the fact that solar panels' output degrades slightly over time. "People in California are extremely litigious so we're super-cautious," he says. As for where to advertise (the medium), high-performance builders use the same mix as everyone else, including an optimized website, local newspapers, radio ads and social media. Thrive has even hired on online sales counselor. His phone number is on every web property, and he interacts with web and social media leads to helps steer them to the product best suited for their needs. When it comes to energy features, show and tell still has its place, if it's sophisticated enough. Thrive, for instance, uses the garage of each model home as a design and technology studio. It's similar in concept to what used to be called the building science center but slicker. It also includes displays that show the difference between the company's homes and those of its competitors, as well as the money buyers will not be spending by purchasing a Zero Energy home. Energy is still important, but in a more competitive environment, the builder has to work a bit harder to quantify its homes' energy use versus that of competitors. 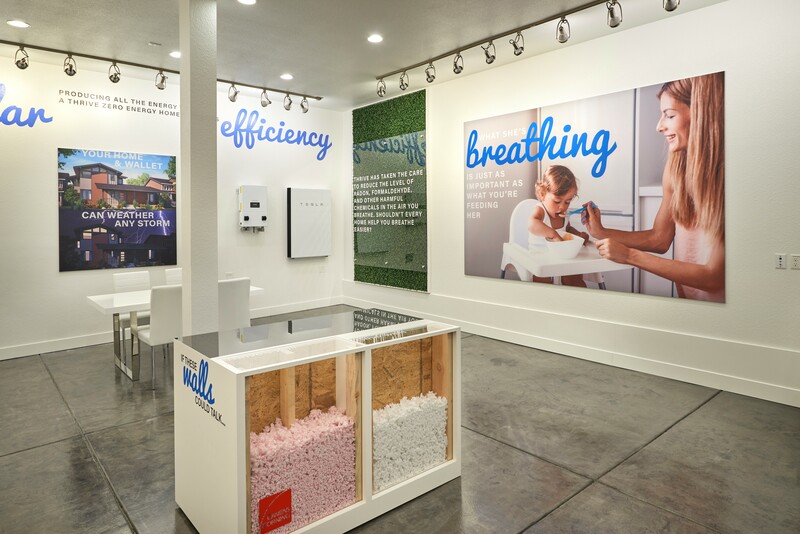 Caption: Thrive's Design and Technology Studio emphasizes the company's health focus while also comparing its homes’ energy efficiency to those of its competitors. More and more high-performance builders are combining those messages in all their marketing materials. Thank you Thrive Home Builers for building Zero Energy Ready Homes (ZERH), these homes are the way of the Future!